Increasing returns are the tendency for that which is ahead to get farther ahead, or for that which loses advantage to lose further advantage. Increasing returns are mechanisms of positive feedback that operate—within markets, businesses, and industries—to reinforce that which gains success or aggravate that which suffers loss. Increasing returns generate not equilibrium but instability. If a product or a company or a technology—one of many competing in a market—gets ahead by chance or clever strategy, increasing returns can magnify this advantage, and the product or company or technology can go on to lock in the market. Network Effects are an example of increasing returns in action. They occur when the more participation in a given network exponentially increases the overall value of the network. 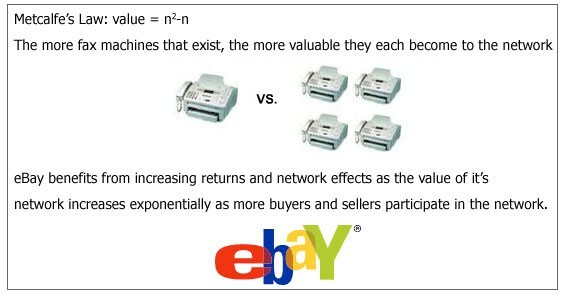 An example is eBay or the worldwide network of fax machines. Bob Metcalfe, who invented Ethernet and founded 3Com, popularized this idea with Metcalfe’s Law. Dependence on Initial Conditions is another example of increasing returns in action. If a particular technology, such as the QWERTY keyboard or internal combustion engine, gains an early advantage it can generate a huge advantage for that technology versus a competing technology.